A unique design of ventilation grilles from Gilberts Blackpool .. 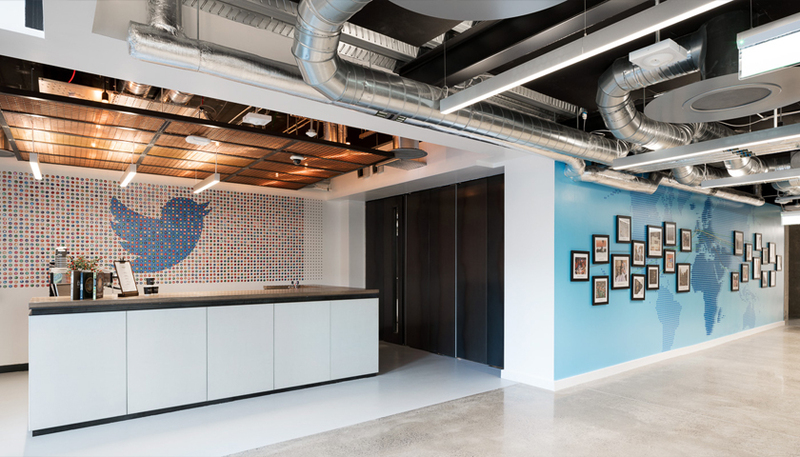 The social media brand’s European, Middle East & Africa (EMEA) headquarters in Cumberland Place, Dublin, is Twitter’s biggest office outside the US. The six storey, 1970s building has been refurbished in partnership with its owners Hibernia REIT to be as eco-friendly as possible. As a result, Cumberland Place has now been awarded the highest LEED certification available- platinum- making it Twitter’s first office to achieve this level of LEED certification, and one of the few offices in Dublin to attain it. Explained Keane Environmental’s Patrick Keane, “Exposed building services were chosen to optimise the floor to ceiling space and create an airy feel to the offices. The consulting engineers METEC realised whilst this approach suited the modern, open ambience the client wanted, it had repercussions-ultimately, without a ceiling effect there would be no way for the air to leave the diffusers, along the ceiling and drop naturally without draughts onto the people below. Gilberts’ circular GSF fixed swirl diffuser – a patented design- uses radial vanes behind a perforated face to allow the introduction of high levels of air horizontally across the ceiling with rapid entrainment and intermixing delivering an omni directional discharge with high room induction. The E variant of this diffuser used at Cumberland House features fixed blades in a circular, rather than square, perforated fascia with removable core; air entry can be top or side, with airflow volumes from 0.025m/3s to 0.477m/3s dependant on diffuser size and neck velocity. Gilberts is the UK’s leading independent air movement specialist. Alongside its comprehensive range of grilles, louvres and diffusers, it has the ability, in-house, to design, manufacture, and test bespoke solutions to meet specific project requirements. It also has one of the most technically-advanced in-house test centres in the country- which it designed and built using internal resources- at its 90,000sq ft Blackpool headquarters. For more information on Ventilation Grilles from Gilberts Blackpool, please click here.